The anatomy and structure of the adult human cornea. The cornea composes the outermost layer of the eye. The cornea is a transparent structure that, together with the lens, provides the refractive power of the eye. This magnified image of a section of the eye demonstrates the structure of the cornea and the limbus. The cornea is comprised of five layers: the outermost corneal epithelium, which consists of superficial epithelial cells, central superbasal epithelial cells and an inner single layer of basal epithelial cells; the Bowman's layer; the corneal stroma which is populated by keratocytes; the Descemet's membrane and the inner corneal endothelium, which is a monolayer of neural crest-derived endothelial cells. The limbus is a narrow ring of tissue located at the border between the cornea and conjunctiva. 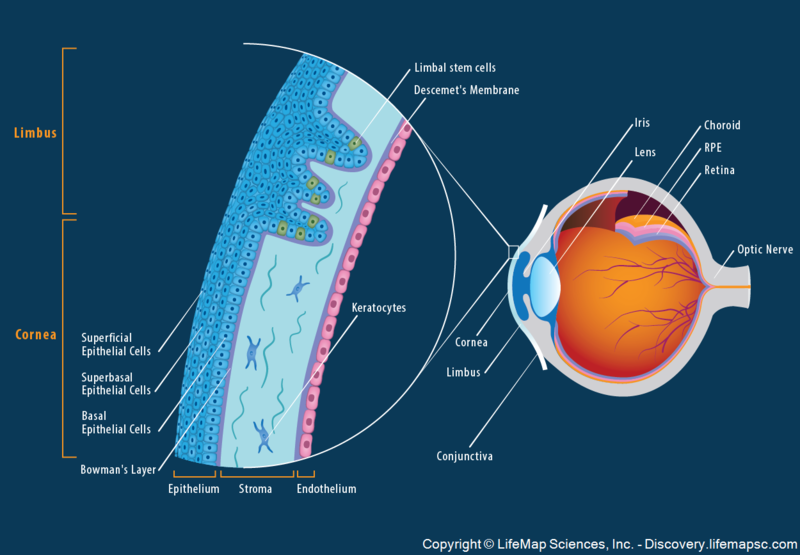 The limbal basal epithelial layer contains limbal stem cells that are required for maintenance of the corneal epithelium.